Sensory Nest Swing 'Winkoh' 1m Diam. Children's outdoor Nest sensory swing - 150kg weight limit - adjustable ropes. 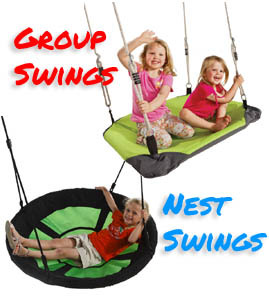 This is a great nest swing because of its size and design - 1m diam round shape allows children to lay down or sit while swinging on the sensory swing. The 'Winko' has padded edges around the nest swing frame for added safety. The fabric material is both strong and comfortable to the touch. Water can pass through it easily. The rings and eights are made in galvanised steel. The welds on the ropes are made in black PP. This nest swing has adjustable ropes. Suites most backyard swing sets of a frame height of up to 2.4mts. The KBT nest swing 'winkoh' is delivered flat-packed in a cardboard box and can be easily assembled.